Physical activity helps maintain good blood flow to the brain. The Dietary Guidelines for Americans recommend that most adults get 30 minutes of moderate activity most days, preferably every day. Short segments of physical activity (such as three 10-minute walks) count toward the goal. Stimulate your brain by adding variety to your activities. Try a new activity, alternate activities throughout the week or take a new route when you walk or jog. Routine activities don’t challenge your brain, so mix it up a little. As we grow older, we tend to grow wiser with each year. While our knowledge can continue to increase, our ability to make connections and process information can slow with age. The good news: Our daily food and fitness habits can make a difference in the aging process. Try these activities to help keep your brain healthy and sharp. 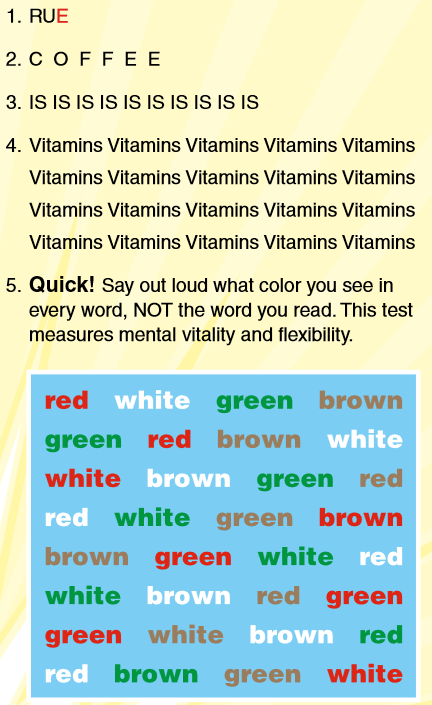 Give your brain a workout and try to solve these brain teasers. Physical activity helps maintain good blood flow to the brain. The Dietary Guidelines for Americans recommend that most adults get 30 minutes of moderate activity most days, preferably every day. Short segments of physical activity (such as three 10-minute walks) count toward the goal. Stimulate your brain by adding variety to your activities. Try a new activity, alternate activities throughout the week or take a new route when you walk or jog. Routine activities don’t challenge your brain, so mix it up a little. Dancing was found to be the No. 1 physical activity to decrease the onset of dementia. Your brain can be exercised just like the rest of your body. Activities such as brain teasers challenge your brain to think in new ways and form new connections. Results of the 2006 ACTIVE (Advanced Cognitive Training for Independent and Vital Elderly) study found that cognitive training resulted in improved cognitive abilities that continued up to five years. Participants were trained for memory, reasoning and speed of processing. See NDSU publication FN1414, “Nourish Your Brain With a Healthful Diet,” for more about brain health. See a two-minute video featuring tennis champion Martina Navratilova talking about nutrition and brain health. Information about the ACTIVE study. For more information on this and other topics.